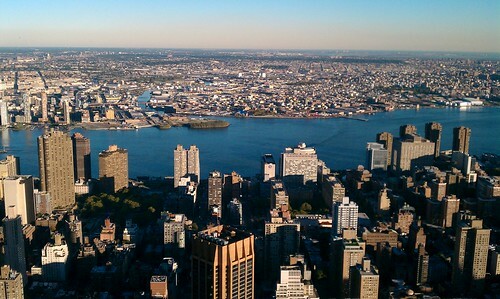 We left off with the first part of my brother’s NYC trip … and here’s the end of it! My brother and I spent the entirety of Tuesday in the American Museum of Natural History. If you’ve never been there, I would classify it as a must-do. The museum is a pay-what-you-wish museum, so, while I advocate supporting museums and always paying the full fare, if you are overwhelmed by the size, it seems reasonable to pay a portion one day and come back another day and pay another portion. It’s easy and fun to spend the whole day there, though – and the cafeteria in the basement makes for a perfectly legitimate lunch! 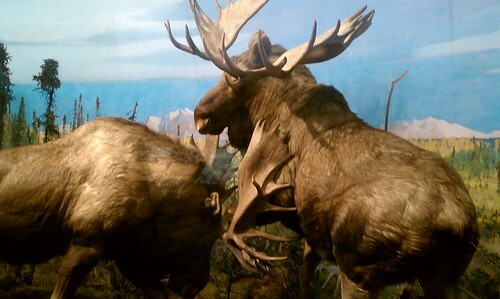 moose fight in the museum! 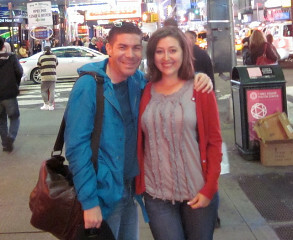 We concluded Tuesday with a trip to the gym, dinner at The Smith, and a stroll through Times Square. After the thrilling Empire State Building, we relaxed at the Southwest Patio in Bryant Park. After a couple of drinks, we walked over to Times Square to check out a Halloween store, and we ran into Casanova from Project Runway! Even though Dave had no idea who he was, he got him to pose for a picture with me! Yay! Thanks, Brother! We concluded our evening with pizza from Lombardi’s. Aside from later introducing my brother to Teen Mom on the DVR, that was pretty much the end of the visit. He had to leave my apartment just after 10 the next morning to make his flight. I’m so glad he came! I had a great time, and I’m looking forward to visiting him at Thanksgiving! The rest of the pictures from his visit are on Flickr! As promised, here is part 2 of my busy week recap! My brother came to visit me on his fall break last week. He arrived last Sunday and stayed through Thursday morning. It was Dave’s first time to New York, and we had so much fun! He arrived on Sunday afternoon, and I almost immediately dragged him down to the Brooklyn Flea. It turns out that the Flea, while one of my favorite things to do, did not impress my brother! When describing it to Matt, he said, “Have you ever been to a garage sale?” Ha, I guess it’s not for everyone! We saw Liz and Matt off, and then we headed into Manhattan. At this point, all three of us (myself, my brother, and Marc) were all pretty tired. We were also hungry, so we got $1.99 falafel sandwiches at Eva’s and ate them in Washington Square Park while people-watching. We strolled through the Village and up into Gramercy, wandering through the enormous and completely overwhelming Eataly before deciding to head home and get Thai from the new place in our neighborhood. 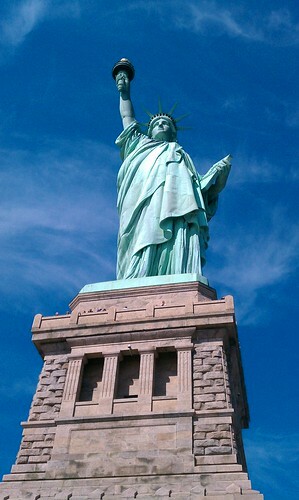 On Monday, as I mentioned, Dave and I visited the Statue of Liberty. We had tickets to go as far as the monument base and, let me tell you, my heart was in my throat just on my way up those stairs! I think my brain remembered the spiral staircase up to the crown and was trying to prevent me from attempting that again! Despite our inability to escape a group of unruly German (or possibly Dutch) teenagers, we had a great time. It was a beautiful day to visit the statue. We then took the ferry over to Ellis Island and toured the museum there before heading back to Battery Park and visiting the National Museum of the American Indian. I wouldn’t waste your time with that museum. It’s a Smithsonian museum, but most of the collection is down in Washington DC. We kept thinking we were missing something – like a whole wing – but the museum there is really very tiny. It is free, though! After that, I took Dave on a tour of Lower Manhattan: we visited Alexander Hamilton’s grave at Trinity Church, walked over to Wall Street and the NYSE, walked over to Ground Zero, and then walked up to the NY Supreme Court. That was when we decided that we needed some frozen margaritas, so we headed home to check out Habana Outpost. We returned home shortly after that, and that was when the hail started. We waited it out and then went to Pequena for dinner. I’ll finish my brother’s visit in the next post! Until then, you can check out the pictures from his trip on Flickr! My mom recently came to NYC for the first time. She arrived on Friday afternoon and left first thing on Wednesday morning; all told, she had just over one hundred hours in this fine city. We covered the city to the best of our ability – this is part 1 of our adventure. 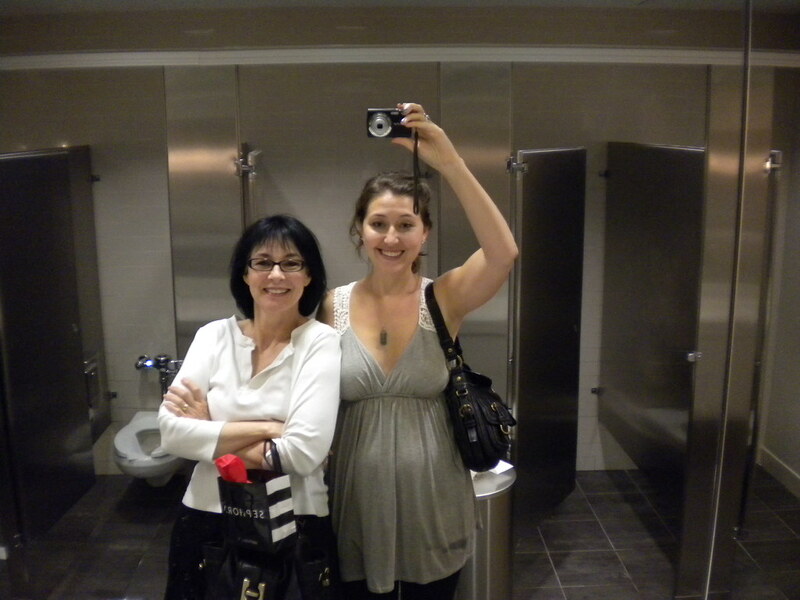 Mom arrived at LaGuardia on Friday afternoon, and I met her at the airport. Airport arrivals are much more fun when you have someone waiting for you at baggage claim! After dropping off her stuff at my apartment, we immediately headed to Bryant Park. I was hoping – although doubting – that we would be able to sit down and have a drink on the Southwest Porch. We obviously weren’t the only ones with that idea, and we couldn’t get a table. Instead, I walked her through and around Bryant Park and inside the main library. If you haven’t been inside there, go! It’s beautiful. I considered hitting Times Square since we were so close, but it’s not as insane-looking during the daylight hours, so I decided to wait until nightfall. I teach Mom how to mirror-photo. Then I walked Mom through the Village and past our old apartment on Bleecker. After getting only slightly lost in the West Village, we eventually found and had dinner at Tartine. Although there was a line, since we were only a party of two, we didn’t have to wait long for a table. I had the tuan nicoise salad that was on special that night, Mom had the sauteed chicken, and we split a bottle of sauvignon blanc. It was a lovely dinner. We capped the night off with a visit to Times Square. Times Square at eleven o’clock on a Friday night is infinitely more exciting than at four-thirty in the afternoon, and so I’m glad that we waited to see it. I think Mom was properly impressed. I love Times Square like I love Vegas: I’m a little embarrassed about it, but I can’t get enough of the bright lights.